With every service we offer, the first priority is to build a relationship with every customer. We believe that if we understand our customer we can better meet their needs with our services. We don’t look at you as just another job on the books. We look at you as a part of our growing family, and family is always the most important thing. Above all else, we are trying to create an environment that is welcoming to all that choose to do business with us. In March of 2009 I setup the LLC for Skywire Electrical Systems, I was working at Beaman Electric at the time. I had an opportunity presented to me for a first job down in Louisiana... I took the opportunity and ran with it. At that time, I cashed out my IRA and used that to survive on ramen noodles and popcorn while embracing the challenges of starting and running a business. I can easily say that for the first few years my life consisted of no weekends and I averaged 80 hours per week minimum. Wearing all of the “hats” was difficult and eventually I was able to pass a few hats to very important key people that are extremely good at what they do. That was a big leap at that time, all I could think was hours that weren't on a job meant hours that were not billable which meant "where is this money coming from to pay them... eeek" But everything has always worked itself out even when I wasn't sure how close we would come to making payroll on a few various occasions. In the first year I knew that I needed a niche and I was always interested in solar, and at the time, solar was a slowly emerging market with very little, to no prospects. I decided to max out my credit card and fly to California to get the only solar training/certification I knew of at that time. Coming back to Missouri I just kept my ear to the ground for any and all potential solar jobs that might be available. I came across a gentlemen in the green building sector that introduced me to a lovely couple that were building a revolutionary off-grid home. I was able to bid on the home electrical portion and wire that home. At the same time I designed and installed the off grid solar solution pro-bono so that I could have my first portfolio job. If you know anything about solar you know that an off grid system is the most complicated that you will deal with compared to a grid tie system or grid tie with battery backup. Everything from that point forward was smooth sailing with having started on the most complex of solar systems. Over the years we were able to build up electrical clientele with a few very big custom home builders, while at the same time word of mouth led to a solar job here and there. With enough solar systems under my belt, and enough class room time I was then able to start the long process of getting NABCEP certified which is the ONLY national standard for solar installation companies. 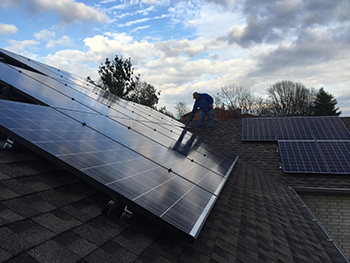 We began to realize in 2017 that our vast customer base of electrical jobs and generator jobs did not clearly realize that we specialize in solar, so with a simple setup process we decided that the wise thing to do for our future solar customers was to help them realize that we do solar by setting up a DBA as Skywire Solar. Now it is as clear as can be, so when advertising and marketing solar we are doing so with the name Skywire Solar. Along the way the beginning of this journey started by housing surplus electrical materials and tools in my shed in the back yard back in 2009, to leaving that home and moving to a new home with a 2 car garage that at first had enough room for my wife's car, and then eventually took over and consumed the whole garage with shelving to hold all electrical materials. At that time we began looking for a property on the S.E. side of Springfield that had a large detached garage that way we could run the company out of the home keeping our overhead costs down. Well, after about two years there and with the amount of traffic that we were bringing to the neighborhood we were approached by a Greene County official being asked to leave or cease business operations because our home residence could not be used for business purposes. Their reasoning was that our street was not an "arterial" street. Since we only moved there for the combo one two punch of having the barn with the home low overhead situation we put our house up for sale. In the year of 2016, I realized that customers that have the space on the ground benefit in so many more ways by keeping the solar on the ground instead of the roof, so we invested and got a loan for a $150,000 machine called the GAYK HRE4000 Pile Driver. It was a bold move that would take a long time to pay off, but I am the field of dreams kind of guy, “if you build it they will come” This machine would officially let us proclaim that we can price a ground mount solar job at the same cost as a roof mount. This is unheard of in our industry due to the simple fact that your roof is already there and ready for solar, vs. the ground that requires dirt excavation, concrete, and excess setup time. To keep this machine busy enough meant we were going to need to sub out our pile driving services to our competitors in all states touching Missouri. Skywire's annual growth over view: In 2013 we had grown to 5 total employees. In 2014 we had 6 Employees and our first company work van. 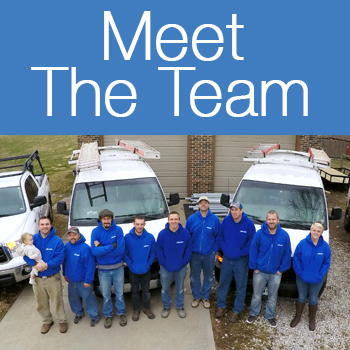 In 2015 we had 9 employees and 5 total company work vehicles. In 2016 we had 7 company work vehicles, one forklift, one Pile Driving Machine, and 13 total employees. Today (11.16.17) we have the same as 2016 but increased employee level to 16 employees. The future is bright, and we believe that with our diversification of being electricians that specialize in solar and generators that we will be able to ride the waves of our economy even if the solar market slows/dwindles, or generator market slows/dwindles.